The Rachel Carson Estuarine Reserve is part of the North Carolina National Estuarine Reserve system, which is a collection of coastal regions that have been preserved and protected to safeguard the wide variety of wildlife that these regions support. Easy to reach for Beaufort visitors as well as vacationers staying throughout the Crystal Coast, the Rachel Carson Reserve is a scenic slice of natural landscape that will be an enticing destination for birdwatchers, kayakers, hikers, and anyone who wants to view the area from a waterfront and wild perspective. The Rachel Carson Reserve includes a collection of islands, salt marshes, and surrounding water, and encompasses a total area of 2,315 acres. The complex of islands includes Carrot Island, Town Marsh, Middle Marsh, Bird Shoal, and Horse Island, and the entire site was completely acquired by the North Carolina National Estuarine Reserve system in 1989. The reserve is situated close to Downtown Beaufort directly across Taylor’s Creek, and is in between the mouths of the Newport and North Rivers, with the Back Sound serving as its southern watery border. As a result of this geography, the estuaries and islands that comprise the reserve are heavily affected by river, tide, and inlet dynamics, with some areas becoming water-logged and soggy with every incoming or outgoing tide. The result of this unique system of water flowing to and surrounding the Rachel Carson Reserve is a mix of fresh and salt waters that in turn allows a wide variety of marine life to thrive. Juvenile fish and invertebrates can be found in the marshes and just offshore, while the local mammals can include everything from gray foxes and otters to the famed wild horses. An array of habitats can be found within the reserve as well, which includes tidal flats, salt marshes, ocean beach, sand dunes, shrub thickets, submerged aquatic vegetation, and maritime forest. As a result, countless birds, mammals, reptiles, and fish species carve out a home on the desolate islands, and can be admired by virtually any visitor who can make the trek to the isolated series of islands. The only way to reach the Rachel Carson reserve is via a ferry, privately owned vessel, or a kayak / canoe, but visitors will be happy to discover that the trek is certainly not an arduous one. A number of ferries or water taxis depart from the Downtown Beaufort waterfront along Front Street, and in the summer months, can be available at roughly 15 minute intervals for visitors who want to take a quick trip to the adjacent shoreline. The ensuing taxi ride takes about 10 minutes at the most, depending on the departure point, and typically lands at the Town Marsh area of the reserve. In addition, there are a number of kayak launch points along Front Street, (as well as watersports companies that rent kayaks and canoes), and travelling across Taylor’s Creek is an easy paddle that takes roughly 15-20 minutes, depending on where you cross, and where you land. Visitors will also find a number of eco-tours and cruises available in a wide variety of mediums, including small vessels, larger cruise boats, and even guided kayak tours. On these adventures, visitors can tour the reserve in virtually its entirety under the guidance of an expert on a quick one hour, two hour, or even a long half-day exploration. For visitors with a personal motorized vessel in tow, a boat ramp is located at 2370 Lennoxville Road in Beaufort, which is open to the public and which is managed by the N.C. Wildlife Resources Commission. There are roughly 30 parking spaces available, which can fill up quickly, so mariners will want to arrive early to secure a spot. From renting a kayak and taking a quick paddle, to hopping aboard a water taxi for an ensuing 10 minute cruise across the creek, reaching the Rachel Carson Reserve is easy provided you start your exploration in the picturesque town of Beaufort. Try to coincide your landing with the “trailhead” at the end of Town Marsh – located on the western edge of the reserve – to enjoy flat beaches and easy to access terrain once you hop ashore. Hiking – From the Town Marsh – one of the westernmost regions of the Rachel Carson Reserve – visitors can enjoy a hike through somewhat rustic terrain to explore the network of islands. A scenic boardwalk is also located at nearby Carrot Island, and trail brochures and information are located at the trailhead in the Town Marsh area. Visitors should note that the network of trails are inherently primitive, and can change with the tides, so sturdy shoes that can handle a little water will come in handy. The marshy areas can also be stocked with natural roadblocks like oyster shells, while the sandy parts can have prickly pear cactus and sand spurs, so visitors will want to use caution throughout the hike. There are two trails within the reserve – the Outer Loop Trail which is 1.1 miles long and is only accessible at low tide, and the Inner Loop trail, which is .9 miles long and is generally accessible year-round. Follow the trail guides or markers from the Town Marsh to explore either of these routes. Birdwatching – More than 200 species make a permanent or temporary home within the Rachel Carson Reserve, which makes it a paradise for visiting birdwatchers. With a locale along the Atlantic Migratory Flyway, and a number of observed species at the site that are considered threatened or endangered, a visitor can check off a lot of boxes on a birdwatchers’ bucket list. Look for piping plover and Wilson’s plover in the winter months, egrets and heron rookery near the shrub thickets of Middle Marsh, and ibises, herons, and egrets throughout the seasons in the marshes and the slightly open sound waters. With so many species congregating in one wild locale, a camera is a must to see all the different birds at rest or play. 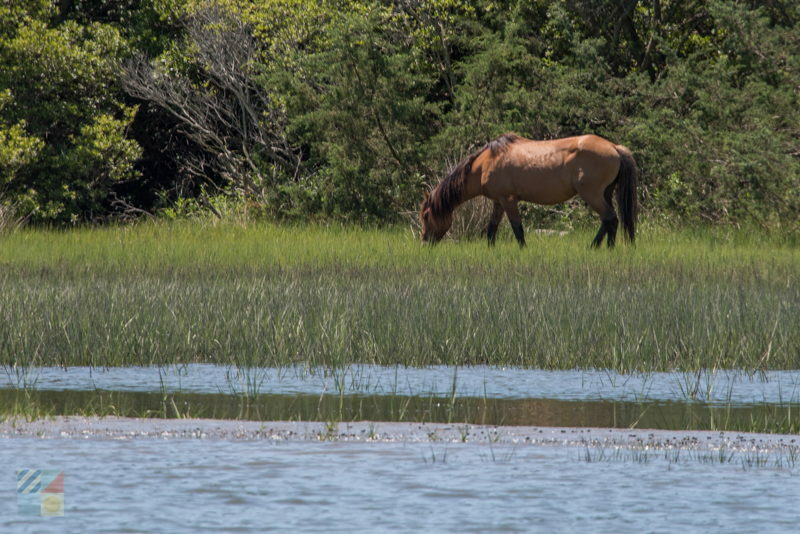 Wild Horses – One of the literally biggest attractions for Rachel Carson Reserve visitors is the population of wild horses that congregate along the shorelines, and which can often be spotted from vantage points all along the Beaufort waterfront. The horses were brought to the island deliberately by a local citizen in the 1940s, and became feral or “wild” over the decades as they survived by eating the local cordgrass and digging for fresh water. Visitors are advised to stay at least 50 ft. away from the horses at all times, but are welcome to snap photos from a safe distance. Kayaking – The network of marshes that surround the Rachel Carson Reserve are perfect for paddlers, and visitors will find a network of naturally formed water trails that can be readily explored via a kayak or canoe. Head to the Middle Marshes across the North River Channel for plenty of winding marshes that are ripe for wildlife viewing, or stick close to the center of the reserve by exploring the Back Sound-bordering regions of Bird Shoal or Horse Island. No matter which direction you go, a world of relatively easy paddling grounds can be found. Shelling – Wade just offshore in the Back Sound waters along Bird Shoal and Horse Island, and you may find some surprising find which includes a unique variety of barely-coastal seashells. Scallops, oysters, and clams regularly make appearances here, and visitors may also be able to spot more ornate species like marsh periwinkles as well. Just be sure and make sure your shell is unoccupied - a number of hermit crabs call the Rachel Carson Reserve home. Educational Programs – Rachel Carson Reserve hosts a number of educational programs throughout the year aimed towards school field trips, kids’ day camps, and everyday visitors alike. From guided visits to unique habitats to educational talks on the local bottlenose dolphins and sea turtles that pay the reserve a visit, there’s a lot to discover with a little help. The headquarters for the reserve is located in the town of Beaufort on 101 Pivers Island Road, and is a good place to start to find out what programs coincide with a Crystal Coast vacation. Bug spray is a must! The local mosquitos don’t see many humans and can be very thick during the summer months. The marshes are home to a wide variety of critters, which can on occasion include poisonous snakes. Be wary of cottonmouths and other dangerous species which may be spotted close to the marshes. There are no restrooms, water fountains, or facilities of any kind on the reserve. So be sure and bring along water, snacks, and anything you need for the ensuing trip. Pets are allowed within the Rachel Carson Reserve, but must be leashed at all times. Visitors are also asked to clean up after their dogs throughout their trip. Camping, fires, and littering are all prohibited on the reserve – (and there are no trash cans on the site.) Being an extra bag or two with you to take out any trash as needed. The Rachel Carson Estuarine Reserve is a scenic destination for visitors who want to sample a natural slice of life on the Crystal Coast. Brimming with wildlife and beautiful scenery, this easy-to-reach deserted island is a great destination for sightseers, birdwatchers, horse fans, photographers, and everyone who adores a great on-the-water view. Where is the Rachel Carson Coastal Estuarine Reserve? The Rachel Carson Coastal Estuarine Reserve is a small collection of islands and marshes that is located in between the town of Beaufort and the Shackleford Banks. It is separated from downtown Beaufort by the narrow Taylor’s Creek, and is separated from the Shackleford Banks by the Back Sound. How big is the Rachel Carson Coastal Estuarine Reserve? The entire Rachel Carson Coastal Estuarine Reserve is 2,315 acres in area. The islands that comprise the Coastal Estuarine Reserve, which includes Carrot Island, Town Marsh, Bird Shoal, and Horse Island, are more than three miles long and less than a mile wide. How do you get to the Rachel Carson Coastal Estuarine Reserve? 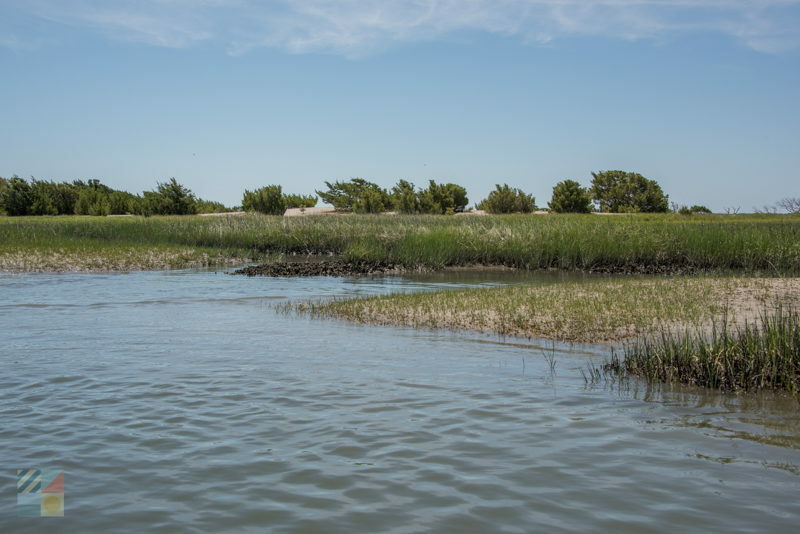 The only way to access the Rachel Carson Coastal Estuarine Reserve is by boat. The N.C. Wildlife Resources Commission has a boating access area located at 2370 Lennoxville Road in Beaufort, and passenger ferries that stop at the Rachel Carson Coastal Estuarine Reserve are available in the downtown Beaufort area as well. What are the islands within the Rachel Carson Coastal Estuarine Reserve? The primary islands that are part of the Rachel Carson Coastal Estuarine Reserve are Carrot Island, Town Marsh, Bird Shoal, Middle Marshes, and Horse Island. Are there ferries to the Rachel Carson Coastal Estuarine Reserve? There are passenger ferries that leave from the waterfront of Beaufort and stop at the Carrot Island, Town Marsh, Bird Shoal, and Horse Island. Because it’s a short trip across Taylor’s Creek, the ferry ride is typically about 10 minutes at most, and is a nominal fee. What can you do on the Rachel Carson Coastal Estuarine Reserve? What is the origin of the name Rachel Carson Coastal Estuarine Reserve? The reserve is named after environmentalist and writer Rachel Carson, who is known for her work protecting and promoting migratory songbirds, as well as other environmental issues. 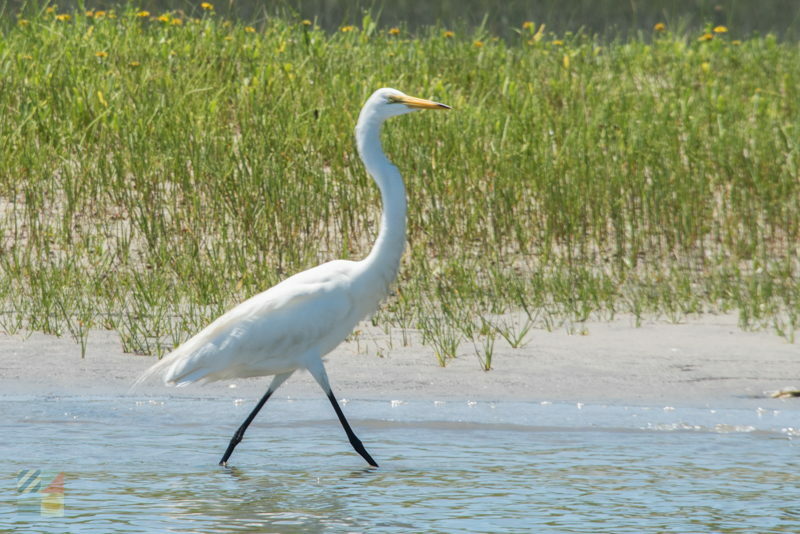 What kind of birds are on the Rachel Carson Coastal Estuarine Reserve? More than 200 species of birds have been recorded at the Rachel Carson Coastal Estuarine Reserve, which due to its location, is inherently part of the migratory Atlantic Flyway. Many species within the reserve are considered endangered, threatened or rare, and the site is also a notable feeding area for Wilson’s plovers in the summer months, and piping plovers in the winter months. An egret and heron rookery is also found in the shrub thickets of the Middle Marsh area. What kind of habitats are on the Rachel Carson Coastal Estuarine Reserve? Because the Rachel Carson Coastal Estuarine Reserve is influenced by the neighboring river, inlets, and tides, it contains a constantly changing series of habitats. Unique environments within the reserve include tidal flats, salt marshes, soft bottoms and shell bottoms, dredge spoil areas, sand dunes and beaches, shrub thickets, submerged aquatic vegetation, and maritime forests. Are there wild horses on the Rachel Carson Coastal Estuarine Reserve? 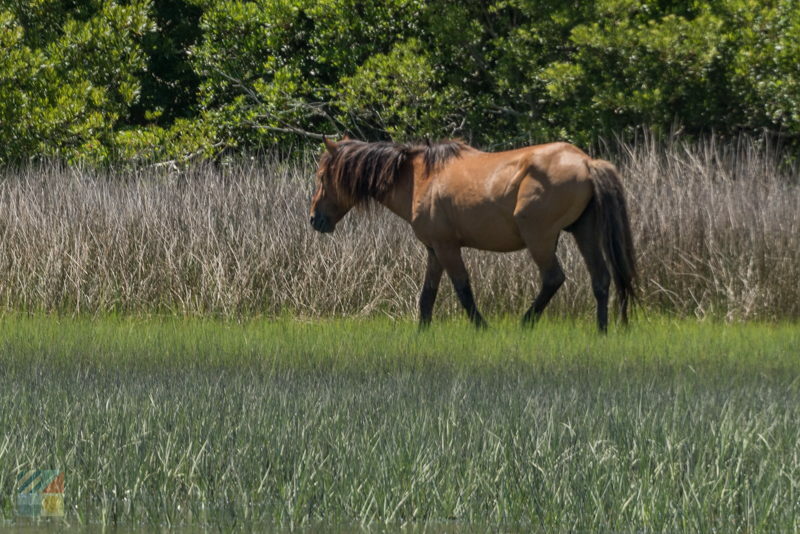 There is a herd of wild horses on the Rachel Carson Coastal Estuarine Reserve, which can often be spotted from a slight distance along the downtown Beaufort waterfront. Visitors to the reserve are advised to stay at least 50 feet away from the feral horses at all times, or about the length of a bus. Where did the wild horses on the Rachel Carson Coastal Estuarine Reserve come from? A local citizen brought horses to the site in the 1940s, and though they are non-native residents of the islands, they eventually became feral and were able to live on the local saltmarsh cordgrass, and fresh water that is retrieved from digging just beneath the surface. Are there restrooms on the Rachel Carson Coastal Estuarine Reserve? There are no restrooms available on the Rachel Carson Coastal Estuarine Reserve. 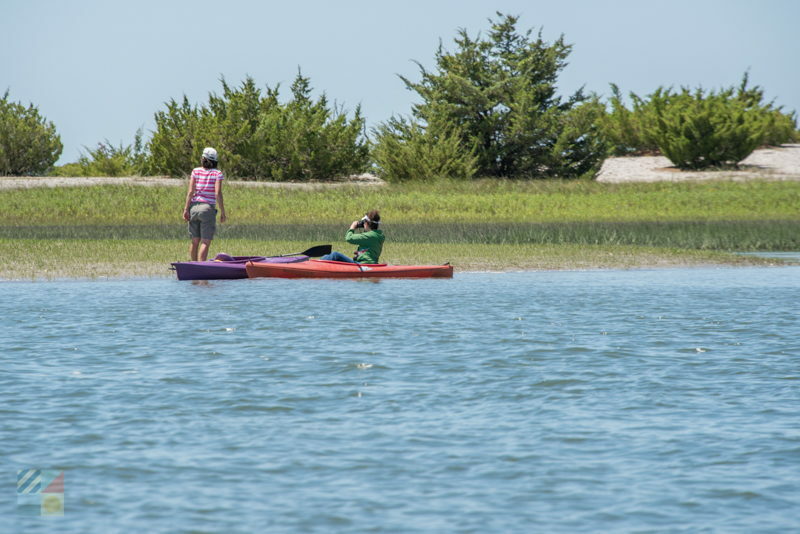 Can you kayak or swim to the Rachel Carson Coastal Estuarine Reserve? 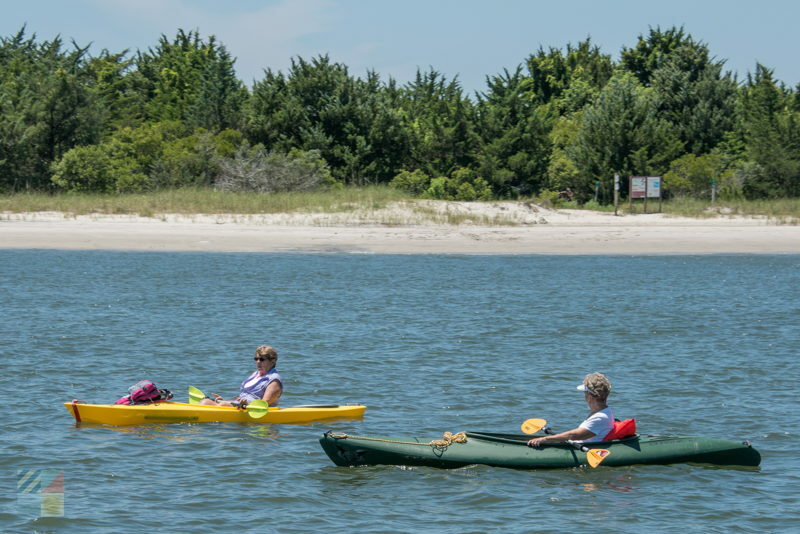 Though swimming is not recommended due to the deceptively swift currents of the nearby inlet and river waters, visitors can easily kayak to the Rachel Carson Coastal Estuarine Reserve via multiple launching points along the Beaufort waterfront. Kayak rentals are also available from a number of area watersports companies. Are there hiking trails on the Rachel Carson Coastal Estuarine Reserve? There are two hiking trails within the Rachel Carson Coastal Estuarine Reserve – the Inner Loop and the Outer Loop - which are both roughly a mile long, and which have interpretive markers throughout. There is also a small boardwalk within the Rachel Carson Coastal Estuarine Reserve as well. Visitors should note that the trails are primitive, and closed toe shoes are recommended. Is there a boat ramp on the Rachel Carson Coastal Estuarine Reserve? There is no boat ramp or public docks located within the Rachel Carson Coastal Estuarine Reserve. A public boat ramp and parking area is located just across Taylor’s Creek, along the Beaufort waterfront. What should you bring when visiting the Rachel Carson Coastal Estuarine Reserve? Because there are limited facilities throughout the Rachel Carson Coastal Estuarine Reserve, visitors should bring along water and snacks. Bug spray and sunscreen are also highly recommended, as well as closed toe shoes or boots to navigate through potential soggy areas or oyster shell piles. Are there mosquitos on the Rachel Carson Coastal Estuarine Reserve? Because of its isolation and concentration of marshes, the Rachel Carson Coastal Estuarine Reserve can be thick with mosquitos in the warm weather months. Summertime visitors should bring along plenty of bug spray, especially on warm days with little to no wind. Can you hunt on the Rachel Carson Coastal Estuarine Reserve? Hunting is permitted on the eastern edge of Carrot Island within the Rachel Carson Coastal Estuarine Reserve. A valid state hunting license from the North Carolina Wildlife Resources Fishing Commission is required, as well as a permit to hunt on the island, which can be reviewed online at http://www.ncwildlife.org/Licensing/Permit-Hunting-Opportunities. Can you fish on the Rachel Carson Coastal Estuarine Reserve? Visitors can frequent the waters that border the Rachel Carson Coastal Estuarine Reserve to fish for a number of species that thrive in the shallow and brackish waters. The reserve itself serves as nursery grounds for a wide array of species as well, and juvenile fish thrive in the reserve’s marshes and waters that are close to shore. Where can you stay near the Rachel Carson Coastal Estuarine Reserve? Visitors can stay in the nearby town of Beaufort to easily access the Rachel Carson Coastal Estuarine Reserve, as the waterfront town is within boating and paddling distance from the reserve’s borders. 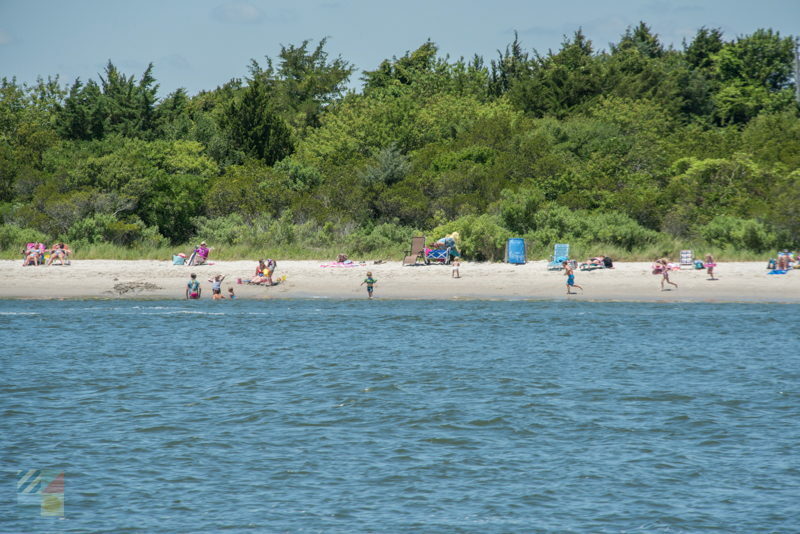 Are there public beaches on the Rachel Carson Coastal Estuarine Reserve? Because the shoreline changes with the wind, currents, and tides, the Rachel Carson Coastal Estuarine Reserve can have sporadic sandy and calm beaches, depending on weather conditions. Visitors should note that while there are sandy beaches in the area, the majority of the terrain is marshlands, shrub thickets, and patches of maritime forest. All beaches and areas of the Rachel Carson Coastal Estuarine Reserve are open to the public. Are there shells on the Rachel Carson Coastal Estuarine Reserve? The Rachel Carson Coastal Estuarine Reserve does have a variety of seashells, including whelks, periwinkles, oysters, and mud snails, however it is not unusual for many of the shells within the reserve to be occupied by hermit crabs or invertebrates. Visitors should avoid taking live shells off of the reserve. Where is the reserve office for the Rachel Carson Coastal Estuarine Reserve? The Rachel Carson Coastal Estuarine Reserve is located on the mainland in the town of Beaufort, just west of the downtown area. Can you reach the Shackleford Banks from the Rachel Carson Coastal Estuarine Reserve? The Rachel Carson Coastal Estuarine Reserve is located in between the mainland North Carolina town of Beaufort and the Shackleford Banks, so it is possible for boaters or paddlers to reach the Shackleford Banks from the reserve’s borders, which is roughly a mile away. 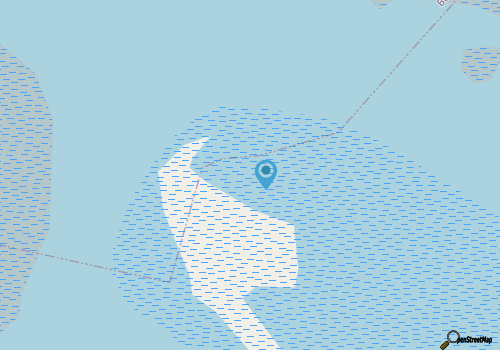 Due to currents, only advanced or guided paddlers should attempt the trek. How far is the Rachel Carson Coastal Estuarine Reserve from Beaufort? The Rachel Carson Coastal Estuarine Reserve is less than .1 miles away from Beaufort, due to its location across from Taylor’s Creek.